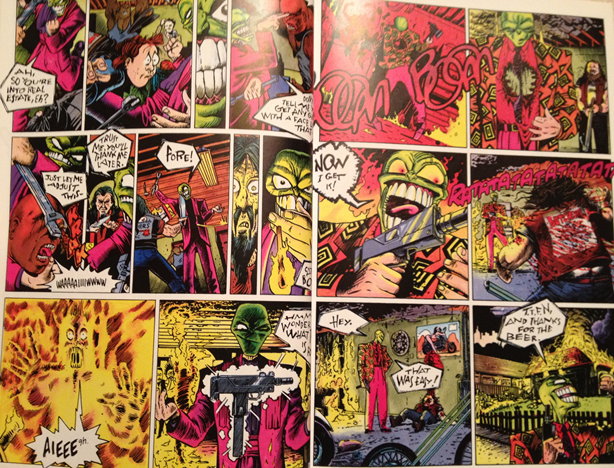 Home › Comics › The Mask Review: Comic Fandom! Why Have You Kept This From Me? The Mask Review: Comic Fandom! Why Have You Kept This From Me? I found myself looking up a list of all the films based originally on comics for an article I was going to do for another site. The obvious Marvel and DC canon majority aside, I learned that there were a few titles that had found a way to distance themselves from their comic origin; works like my childhood favorite The Men in Black and the so odd that it must be true A History of Violence are both examples. One could say that Ghost World fits a similar bill, but I tend to hear that film brought up exclusively as a comic adaption more often than not. 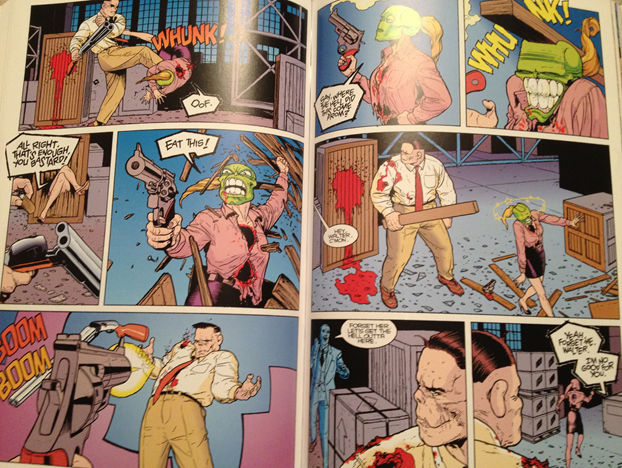 But now is not the time to prattle on about film, for I have a comic to review; you folks might have caught on that I have in hand 1991’s The Mask. To find the origin of the Mask, I dug up that Dark Horse founder Mike Richardson created the idea of what would later become known as The Masque in the pages of Dark Horse Presents in the mid-80. Time passed and the most recognizable (and what is currently receiving my spot light focus) is its true start in 1991, this time written by John Arcudi and drawn by Doug Mahnke, creators of the tonally similar Major Bummer. I felt the need to limit this review to what is collected in the first omnibus volume (containing The Mask, The Mask Returns, and The Mask Strikes Back), so I will list off the various colorists and inkers later down the line. Spastic sweater vest wearer Stanley Ipkiss has found himself at his wit’s end. After attempting to buy his girlfriend Katherine a jade colored mask as an apology gift, he is beaten up by a local biker gang for calling them out for soaking his car. With comedic depictions of how he would like to get back at them filling his head, Stanley hears a voice coming from the mask whilst at the door to Katherine’s apartment. He plays it off as nothing but later that night after giving Katherine the mask, he finds that it has moved to meet him during a midnight bath room break. Curiosity takes over Stanley decides to put on the mask, turning into a similarly jade headed being bestowed with invulnerability, super human reflexes, the ability to manifest matter from nothing, wear skin copies of people’s faces, and most important of all, some rather quick humor. As one would expect, Stanley’s new powers push him to reenact all those funny man-slaughter related machinations that he had early towards that biker gang, and he does just that. And by that I mean he finds small thing that people have done in his life and kills them outright to justify his personal world. But as one would have it, comically butchering tons of people in a town gets you the attention of the cops, specifically Lieutenant Kellaway, and the moniker of “Big Head” to some up your killing spree. Not to delve too deep, but Ipkiss is not long for this world, and the rest of the mask’s journey takes place on the faces of others. Boy does that mask get around! When writing about The Mask, it is just easier to write about the mask’s impression and one sole antagonist. See, the mask will be defined by the user in distinct ways, with Frank Sinatra impressions stemming from one person to a pot related trippy world of another. What makes it great is that these traits translate over much later down the line. The only real threat to the Big Head menace is Solomon Grundy…I mean Walter, a mafia enforcer with mountainous size and high tolerance for pain (both given and self-inflicted). What makes Walter interesting is that his silent visage started as a no-name goon, but I felt that John Arcudi thought to himself, “Hmmm…I can use him”, and those we have Big Head’s first real adversary. Starting in order from what is listed above, Matt Webb’s faded colors stands out first as unattractive and stark, but features nice touches like letting sprayed blood breach the panel barriers. Chris Chalenor’s use of pure color per object is personally my favorite companion to Doug Mahnke’s sharp line work, allowing for some great detailed facial expressions. Colorist Gregory Wright and Inkers Keith Williams and Rich Perrotta help to give Mahnke’s work that extra leg of color and object-oriented flare, a must for the constant mask sharing that goes on during their run. Pros: This comic is able to keep up an interconnecting story that keeps its world distinct; while continuing to not suffer from the narrative dilemmas fourth wall breaking humor provides. Each part is visually distinctive, championing both great color and visual innovation. The epitome of fun in a comic that is still capable of taking itself seriously. Cons: Doug Mahnke’s artwork progresses greatly over the comics run, but that spit polish looks to be much-needed during the entire Ipkiss arc. This may prove to be far too random for readers not able to wrap their heads around a persona that expects the rest of the world to do the serious acting for them. 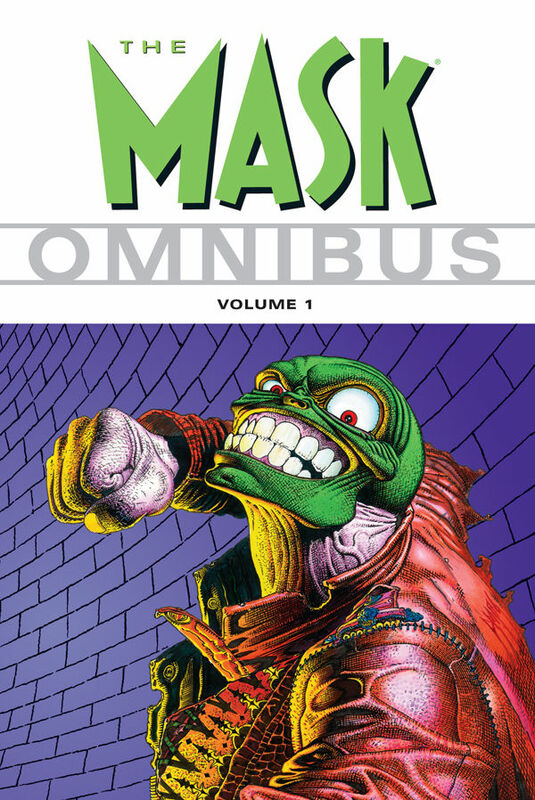 The Mask spawned tons of limited series and spin-offs (like the one where Walter shouts for Major, something I would kill to read), but the Part 1 omnibus from Dark Horse that I have concludes what is considered the creators original run. I know that you are tired of me writing about this Internet, but how come I cannot get any non-Jim Carrey Mask replica busts even though this franchise was huge in the 90’s? 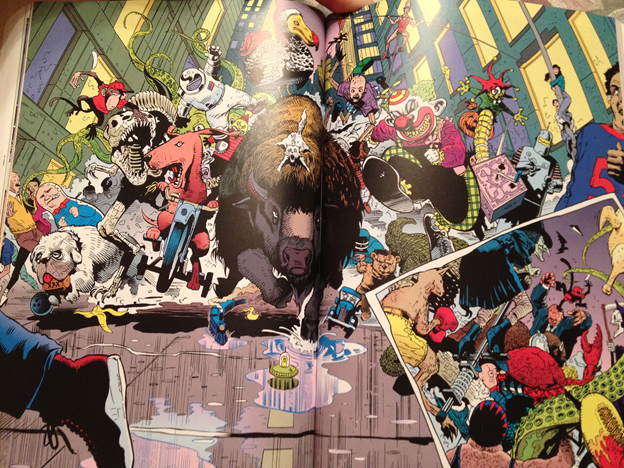 How can a comic as great as The Mask not call forth even one new piece of merchandise, while Wonder Woman finds herself with enough modeled entities to fill a room (a sight that reflects a friend of mine’s office). Oh, the comic itself, there is no reason why you should not already have this figure of American comic history. ‹ Magic Knight Rayearth Review: Wait? I Have Seen This Before, Yet It Is Somehow Different. Oh, you’re fine. It’s all downhill after that. The next two volumes have much less of the ‘mounting horror’ vibe, much more ‘goofy superheroics’ inspired by the movie, that arguably began with The Mask Strikes Back in this volume. (especially as volume three is mostly the comic adaptation of the animated adaptation of the movie adaptation… phew) That, or a lot of navel-gazing.